Covering more than one hundred years of history, this multidisciplinary collection of essays explores the vital connections between popular music and citizenship in Brazil. While popular music has served as an effective resource for communities to stake claims to political, social, and cultural rights in Brazil, it has also been appropriated by the state in its efforts to manage and control a socially, racially, and geographically diverse nation. The question of citizenship has also been a recurrent theme in the work of many of Brazil's most important musicians. These essays explore popular music in relation to national identity, social class, racial formations, community organizing, political protest, and emergent forms of distribution and consumption. Contributors examine the cultural politics of samba in the 1930s, the trajectory of middle-class musical sensibility associated with Musica Popular Brasileira (MPB), rock and re-democratization in the 1980s, music and black identity in Bahia, hip hop and community organizing in Sao Paulo, and the repression of baile funk in Rio in the 1990s. 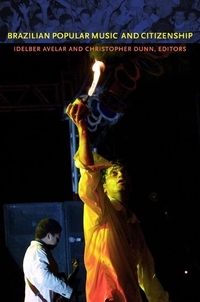 Among other topics, they consider the use of music by the Landless Workers' Movement, the performance of identity by Japanese Brazilian musicians, the mangue beat movement of Recife, and the emergence of new regional styles, such as lambadao and tecnobrega, that circulate outside of conventional distribution channels. Taken together, the essays reveal the important connections between citizenship, national belonging, and Brazilian popular music.